Now that I’m using my nexus 7 significantly more than my laptop from day to day, I’m always looking for applications to make my life easier while adding functionality and usability to my tablet. Enter “Swapps”. 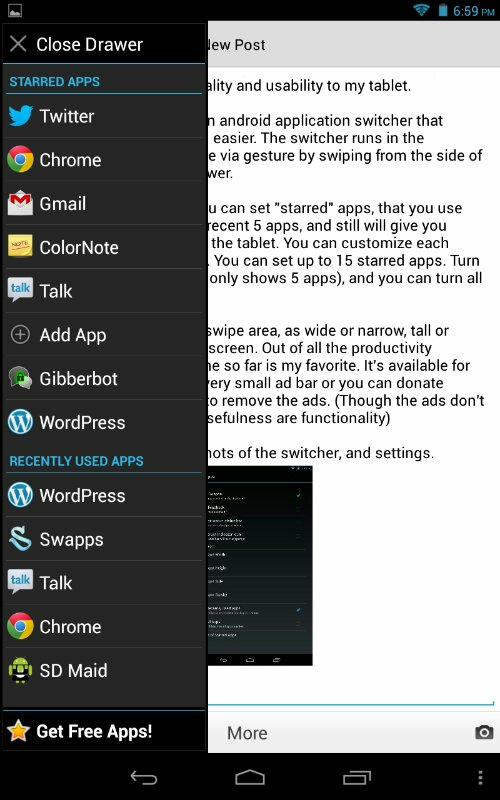 Swapps is an android application switcher that makes multitasking so much easier. The switcher runs in the background and is accessible via gesture by swiping from the side of the screen to access the drawer. 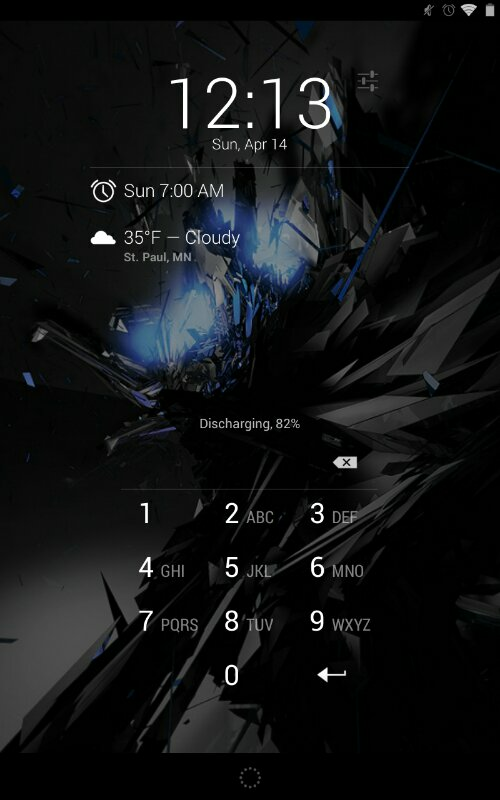 From the launcher drawer, you can set “starred” apps, that you use the most, it shows the most recent 5 apps, and still will give you access to all applications on the tablet. You can customize each section through the settings. 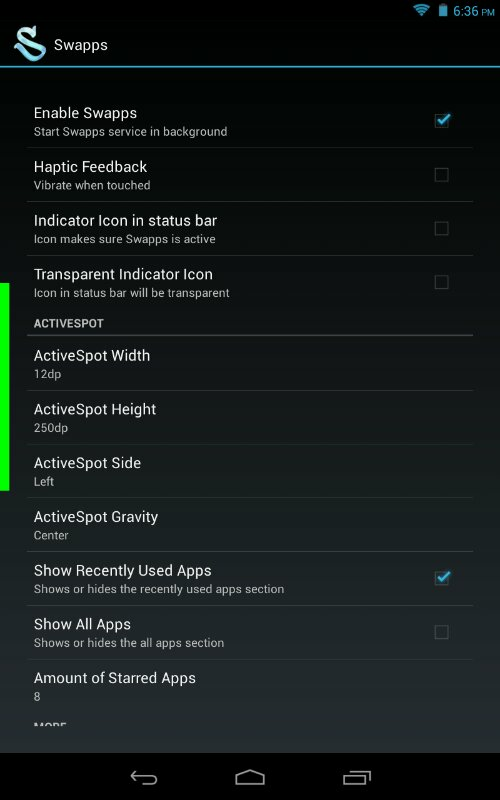 You can set up to 15 starred apps. 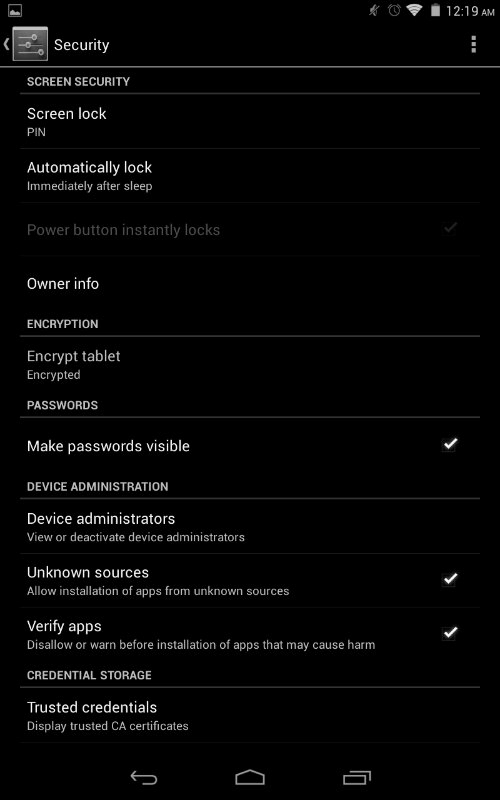 Turn recent apps on or off (recent only shows 5 apps), and you can turn all apps on or off. I’ve attached some screen shots of the switcher, and settings. Also, I would like to add that you can kill background processes by long pressing an app in the “recent” section. Here is the Google play store link, this is one app I very much think you should try! So today is that horrible holiday where a fast jolly elf comes in and raids our homes km leaving us goodies in exchange for cookies and milk. Yes, today is Christmas. Amidst all the horrible joyful gnashing of children’s teeth over toys and candy and food, I opened my lone present, a gift of fairly small size, compared to the doll houses, Lego’s, and found in my hands a wonderful Nexus 7. This blog post is being written with the tablet’s WordPress app, and will be a review of my first thoughts and impressions. So I started reading about it back in July and knew the rooting process was easy, but that unlocking the bootloader would wipe the entire device so anything stored on it would be gone. so I decided to root it right out of the box. I had to let it charge for about two hours before the battery was full, but then routing took only about five minutes. I have been very impressed with the features and speed of the device. The swipe keyboard input for jelly bean, is amazing. I’ve been using the sale this whole post and its only messed up three times. The app switching and multitasking is fast and responsive. Overall, I have not played with a better tablet and couldn’t be happier with my choice of computing device, and this will for the most part take the place of my laptop. So, I have not been very active online lately, life has been taking its toll on my ability to open up the laptop and try to do anything, but as a cure to many of the things holding me back from my pure unleashed potential is my disorganization. Thanks to terrible ADHD and resistance to many of the common medications, I am very scatter brained. I try to use to-do lists, and devices to keep track of things i’m trying to accomplish, but many of my devices are clumsy and awkward, or just plain impossible to carry with me when i’m out running errands. Well for christmas i’m getting myself a Nexus 7 32GB tablet, and will be getting it set up as a main device. I’ve used an iPad2 (issued through work) and attempted to use it for mobile organization, but the form factor is too large to make it useful. its hard to carry around with me, and use or pull out when i need to do anything. where as the 7 inch format is something that has been my target for a few years, and now the hardware has come up to compete directly with the laptops i would have purchased. through google drive, dropbox, and the on device storage, i should have more than enough space for my usage. my only problem is that it doesn’t have a rear facing camera, which means i will still need to carry a phone with me for pictures of the kids and such, but for everything else, i should be able to live on a device that fits in my back pocket.